Mysterious shapes, abstract forms. Wood, bronze and stone. Sculptures and photographs, collages and photograms, textiles and drawings. The first London retrospective for fifty years of the work of Barbara Hepworth, the pioneer of British avant-garde, will be opened at Tate Britain on 24 June and it will last to 25 October 2015. Barbara Hepworth was one of the most significant British artists of the 20th century — modernist sculptor of international fame. Her golden age is dated from the 1950s to 1960s, when she became one of the most successful artists in the world. Hepworth’s triumph was doubled by the fact that she was also a pioneering woman sculptor. According to Inga Fraser, Assistant Curator at Tate Britain, Hepworth was a trailblazer as a woman artist who forged a successful career alongside some of best-known men in the arts in the 20th century. Her visibility paving the way for future generations of women artists and women more generally in society. She proposed a way of working on her own terms, adhering to her own personal artistic vision and achieving success with works publically exhibited and acquired by national collections worldwide, from South America to Japan. 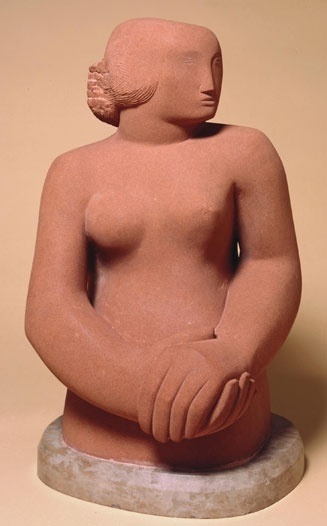 The exhibition will present over 70 works, beginning with her earliest, less known sculptures from the 1920s, through the 1930s strongly abstract carvings, to the most outstanding works from the time of her highest artistic rise. The title of the exhibition reflects the change in artist’s approach to sculpture, politics, culture and social environment during all years of her career. It announces a big quest by the trace of one of the leading modernist artists — from her experimentation with photography and design in the 1930s to her adoption of new materials that allowed her to work at scale and in relation to the modernist architecture of postwar Europe and America in the 1960s. A considerable advantage of the retrospective is an idea to locate Hepworth’s activity in the wider cultural context. Besides her works, exhibition will be diversified with carvings of artists who was in some way bonded with Hepworth, such as Jacob Epstein or Henry Moore. According to strong artistic integration with her second husband, Ben Nicholson, Hepworth’s works can be seen alongside Nicholson paintings, prints and drawings. Moreover, because of strong connection with the international abstract movement spread through magazines, some Hepworth’s works will be accompanied by the journals featuring the works of figures such as Alberto Giacometti and Piet Mondrian. As Miss Fraser said to PURPOSE, these will show how deeply embedded Hepworth was in the development of sculpture on an international stage both before and after the Second World War. Another important part of exhibition is display of Barbara Hepworth’s photographs. In order to find the best way of presenting her works in two dimensions, she was experimenting with many different photographic techniques, using collage, photograms and double exposure. They were found in Hepworth’s archives and they will be shown at Tate Britain for the very first time. The real bargain are personal albums compiled by Hepworth and Nicholson from the photographs depicted two artists during work in their studio in Hampstead, London, showing the great compound of life and art. At the same time, we hope to reveal the different ways in which Hepworth considered the staging of her work and the means by which it was disseminated, through photography, reproduction, display in- and out-of-doors, in the studio and in the public realm, Miss Fraser said. The first London museum exhibition of Barbara Hepworth works surely will emphasize her input in international art world. It may also show her works in different light, by adding a whole cultural context built by other artists sculptures and the photographs revealing Hepoworth’s view on her own life and creativity. With immediate formal and tactile quality and stature, deriving from her utopian belief in the universal appeal of art, her sculpture appeals to diverse audiences today. Her works also continue to inspire/intrigue a younger generation of artists such as Gerard Byrne, Elizabeth Price and Charlotte Moth, who have revisited the sites, forms and meanings of her modernist sculpture in contemporary moving image, performance and installation works.